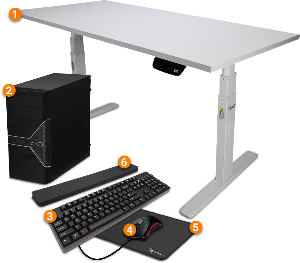 Prize: Adjustable Electric Standing Desk; Dual-Fan ATX Mini Tower Case; Mechanical Gaming Keyboard; (Cherry MX Brown Switches); RGB Optical Wired Gaming Mouse (6000 dpi); Pro Gaming Mouse Pad; Keyboard Wrist Rest ($1,060). Statistics: This contest was opened by 48 and entered by 9 ContestChest.com members. 19% of those who opened the contest, entered it.